Burma, listed as one of the world's most corrupt nations for (among other things) their militant suppression of dissent, is now in the middle of a crisis as thousands of Buddhist monks have taken to the streets in protest against the government's corruption and in support for democracy. 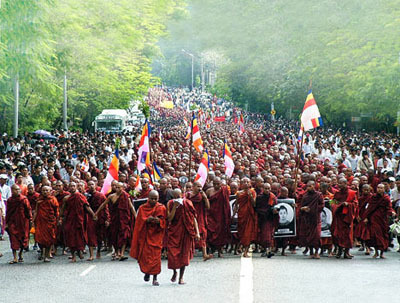 In 1988, a similar protest resulted in the deaths of thousands, as Burmese troops fired on the unarmed protesters. I pray this ends well for the people of Burma.